The latest personality type craze is in full force, complete with Instagram meme accounts popping up weekly and mentions by that particular group of cool Christian influencers who all seem to know each other. I have to admit I’m obsessed as the rest but believe me, I understand the eye rolls. I can’t seem to turn enneagram brain off, though, because ever since a friend introduced it to me three years ago, it has been the single most powerful tool in my personal and spiritual growth. I used to be a Myers-Briggs junkie but when I discovered my enneagram type, it felt like someone had been eavesdropping on my internal dialogue. No personality test had exposed me like that. What sets the enneagram apart from other systems is its focus on motivations rather than behaviors. It’s an insightful approach because two people can exhibit identical behaviors but be compelled for completely different reasons. For example, one person could be a workaholic due to a desire for respect, while another might overwork themselves to avoid disappointing others. I also appreciate how the enneagram doesn’t shy away from the negative aspects of each personality. Studying the enneagram is actually quite painful because the destructive coping mechanisms it describes are all too familiar. Although it’s difficult to confront, it ultimately helps each type understand how they are wired - for better or worse - because our greatest strengths are often our greatest weaknesses. But the real gift of the enneagram is how it exposes the flaws in the story I’m telling about myself. We all have core values that seem so self-evident that we fail to question them, when in reality they are the mask we cling to for security and significance. We create false systems for ourselves that we’re rigged to lose. The enneagram has rocked my worldview time and time again because the expectations I’ve been so anxious to fulfill have turned out to be self-imposed. The enneagram wakes me up to myself and the world as it really is, and I’ve felt less burdened for it. Beyond my personal journey, the enneagram has proven useful in my relationships. I had several aha! moments in a row when my brother typed himself as a Five. Now I have so much more grace for him and many of the confusing aspects of our dynamic started to make sense to me. So many resources are available to those interested in exploring the enneagram, but it can be hard to know where to start. This post has evolved from a list of links I have sent to interested friends on multiple occasions. I’m sure I’ll be adding to it as I continue my studies! Since the enneagram is more about internal life than behavior, a quiz won’t be as accurate but it can give you an idea of where to start. I always recommend The Road Back to You Introductory Enneagram Assessment for a free quiz if that’s the case. I also suggest listening to the Enneagram episode on The Liturgists podcast because they include submissions from members of each type. Hearing them describe themselves in their own words helped confirm my suspicions that I was a Four. Another way to approach typing yourself is to first narrow down which Intelligence Center you belong to: Head, Heart or Body. More on that in the Triads section below. The arrows illustrate the tendencies of each type in periods of stress and growth. In difficult times (disintegration), we borrow from the negative traits of one of the other types in order to help us survive. In times of thriving (integration), we draw from the positive traits of a second type. Example: As a Four, I become more organized and objective like a One when I’m healthy. In periods of unhealth, I grow clingy and manipulative, exhibiting the negative qualities of a Two. The wings are the types adjacent to yours. You might draw from your wings equally but usually people have a tendency to lean more to one side than the other. Example: As a Four, my wings are Five and Three. I first thought I was a Four with a Three wing (4w3) because I often tie my worth to my productivity like a Three, and can be sensitive to other people’s perceptions. But over time I’ve realized I’m much more prone to solitude and overthinking like a Five. To learn more about the wings, Integrative Enneagram Solutions has a handy guide. The Instinctual Subtypes are where it really starts to get interesting. When I discovered my subtype, several aspects of my behavior and values came into focus, adding even more layers to my type. It’s also important to note that two types are disproportionately affected by the subtypes. Sixes and Fours vary so much by subtype that they could almost be categorized as distinct types. The three subtypes are Social, Sexual (or One-To-One) and Self-Preservation. All three subtypes are present in each person, but each person has a dominant, secondary and repressed instinct (with the latter being a blind spot). Each type also has an instinctual countertype that seemingly contradicts the tendencies of the enneagram number. The best way these subtypes have been described to me is through the illustration of a party. A Social Type would enter the room and immediately evaluate their place in the hierarchy of the group and notice the needs of each person. A Sexual Type would quickly identify the most interesting person at the party and proceed to talk to that person for the rest of the night. Finally, the Self-Preservation Type would take note of the temperature and noise level of the room, then make a beeline for the food. That illustration is a gross simplification of reality, of course, so discovering your subtype will require further study. Beatrice Chestnut writes extensively about the subtypes in her book, The Complete Enneagram. You can also read a brief summary of each subtype on her website and the extensive descriptions from her book that someone has kindly uploaded on Personality Cafe. Two more resources: Type Stackings and Beth McCord’s subtypes guide on her Instagram account, @yourenneagramcoach. When a close friend of mine suggested I was a Self-Preservation Four, I wasn’t so sure at first because my relationships carry great significance for me. But reading the description resonated too deeply for me to ignore. As the countertype of my enneagram number, SP 4s tends to bury their feelings instead of flaunt them. They experience emotions as varied and powerful as other Fours but manage to appear stoic. My parents rightly discouraged me from indulging my feelings when I was younger and since then I’ve overcorrected by suppressing or invalidating them instead. Out of a need to survive, I’ve developed the ability to be long-suffering. While perseverance is a useful quality, it has been damaging at times by hindering my ability to face my feelings and resolve them. My Self-Preservation instinct also reveals itself in my attraction to all things domestic. Growing up as a missionary kid bouncing between Thailand and the States, I often struggle with feeling rootless so I overcompensate with a strong attachment to place. Sometimes I grasp too tightly to my cozy apartment and my need for financial security. But I also appreciate how my instinct has fed into my love for hospitality as I create a home for myself and other misfits like me. The nine types are divided into three sections representing the intelligence centers: Head (Mind), Heart and Body (or Gut). Head types respond to stress by thinking, Heart types respond with emotions, and Body types respond with instinctive action. Each triad is marked by a dominant emotion as well. Head types suffer from fear and anxiety, Heart types struggle with shame, and Body types deal with anger. At the center of each triad is a countertype that is disconnected from its primary intelligence. 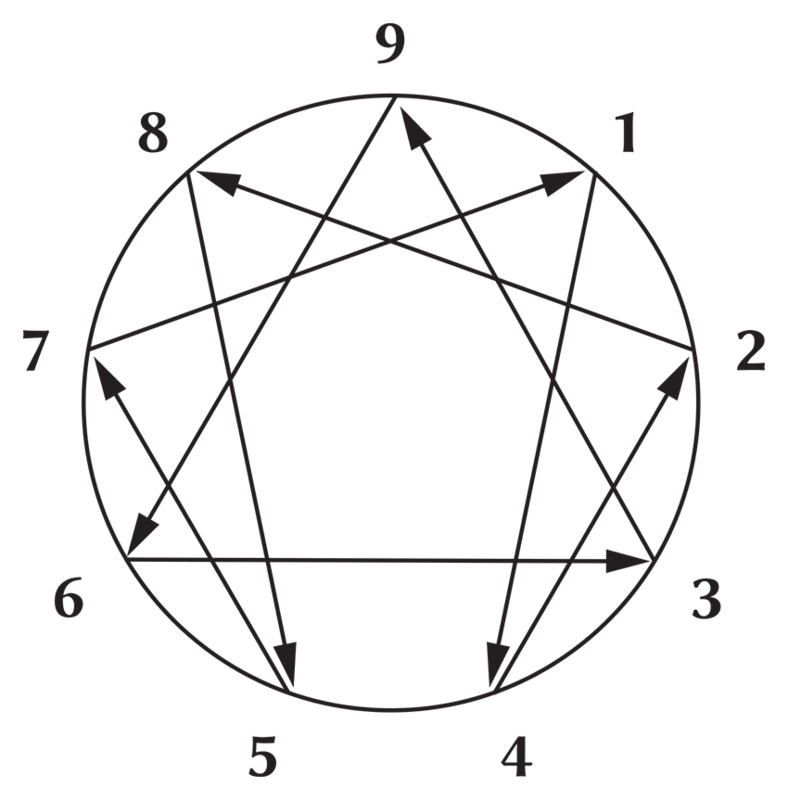 Also called shock points, they are indicated by the points of the triangle in the center of the enneagram. Threes are disconnected from their hearts because of their image-consciousness - in their preoccupation with people’s perceptions of them, they forget who they are. Sixes are disconnected from their minds because their tendency to overthink can lead to irrational fear. Nines are disconnected from their bodies because their pursuit of peace means they forget to remain present and engaged in the physical world around them. The Sacred Enneagram introduced me to the Harmony Triads, also categorized as the Dominant Affect Groups. These groupings describe how each type relates to the world around them. You can read more about the harmony triads on Dr. David Daniels’ website or in The Sacred Enneagram by Chris Heuertz. Chris Heuertz wrote the most horrible sentence I have ever read as a Four: “As Idealists, Fours never quite attain what they desire, which becomes a self-perpetuating source of sadness.” I dropped the book in my lap and seethed. What’s the point of anything if my longing will never be satisfied? I still resent Chris for that one but I know I needed to hear it so I can learn to live in the present and appreciate what’s before me. It’s also strangely comforting knowing this longing is normal and I’m not missing out on some big secret to perfect fulfillment. Our fallen world was never meant to satisfy. In my research for this blog post, I accidentally discovered EVEN MORE LAYERS. I’m not as well versed in the following two triads but I’m including brief summaries below for further investigation. The Hornevian Groups describe each type’s stance in relation to other people. Also known as the Active Types, these types move against people by taking initiative. Also known as the Balancing Types, these types move with people by adapting. Also known as the Receptive Types, these types move away from people to reach inward instead. Read more about the Hornevian Groups on Dr. David Daniel’s website and on the Enneagram Philosophy website. Also called the Emotional Regulation Types (ERTs), the Harmonic Groups describe each type’s reaction to the world (as opposed to their actions in the Hornevian Groups). Also known as the Expressing Types in the ERT system, Reactive Types respond to stress by openly sharing their emotional reactions. Also known as the Reframing Types in the ERT system, the Positive Outlook Types respond to stress by minimizing the problem and looking for a silver lining. Also known as the Containing Types in the ERT system, the Competency Types respond to stress by suppressing their feelings and solving the problem through objectivity. Read more about the Harmonic Groups on Dr. David Daniel’s website, Rob Fitzel’s website and the Enneagram Philosophy website. The enneagram has deep religious and philosophical roots, so it would be remiss of me to leave out an overview of its spiritual dimension. The passions are the traditional sins associated with each type, and the fixations describe the unhealthy thought patterns resulting from those passions. However, as each type grows more self-aware, they can begin to display virtues that counteract those passions. Ones struggle with Anger and fixate on Resentment but can learn to demonstrate the virtue of Serenity. Twos struggle with Pride and fixate on Flattery but can learn to demonstrate the virtue of Humility. Threes struggle with Deceit and fixate on Vanity but can learn to demonstrate the virtue of Truthfulness. Fours struggle with Envy and fixate on Melancholy but can learn to demonstrate the virtue of Equanimity. Fives struggle with Avarice and fixate on Stinginess but can learn to demonstrate the virtue of Non-Attachment. Sixes struggle with Fear and fixate on Cowardice but can learn to demonstrate the virtue of Courage. Sevens struggle with Gluttony and fixate on Planning but can learn to demonstrate the virtue of Sobriety. Eights struggle with Lust and fixate on Vengeance but can learn to demonstrate the virtue of Innocence. Nines struggle with Sloth and fixate on Indolence but can learn to demonstrate the virtue of Action. As a Four, I struggle with Envy in my longing for the happiness and fulfillment everyone except me appears to have attained. My fixation on Melancholy is reflected in my tendency to indulge feelings of sadness and feed into my self-composed narrative of brokenness (i.e. my Outsider Complex). For me, growing in health and self-awareness means reminding myself of truth and learning not to allow my feelings to sweep me away. Chris Heuertz suggests contemplative practices for each type’s in his book, The Sacred Enneagram. My desire for significance in the eyes of others often leads to an exhausting compulsion to perform so I can be affirmed as someone who fulfills the world’s unique need. When I practice resting in solitude, I am essentially fasting from being seen and respected. It forces me to affirm my intrinsic worth as a child of God, apart from anything I can do for him to leave my mark on the world. Read more about the contemplative practices in The Sacred Enneagram by Chris Heuertz. 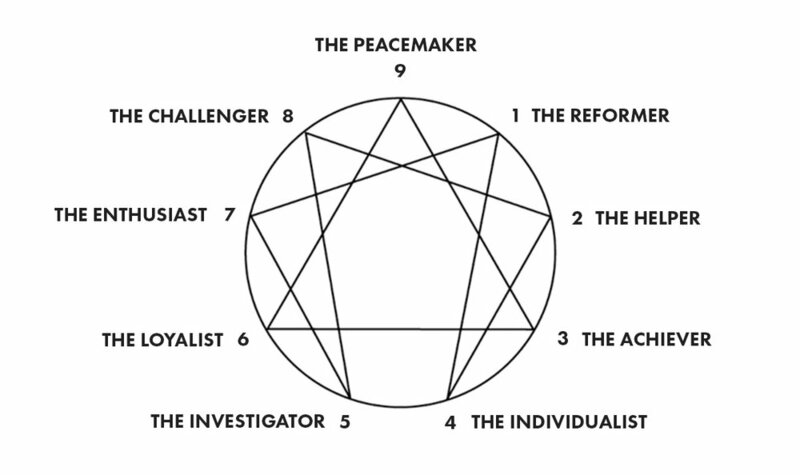 You can also read about the history of the enneagram on The Enneagram Institute. One of my favorite musicians of all time, Ryan O’Neal of Sleeping At Last, is writing songs for each of the enneagram types! He’s currently writing the song for Eight, so he only has two more to go. Listen to the ongoing playlist. The art for each single is created by Elicia Edijanto, complete with animal totems for each type. He also produces the Sleeping At Last podcast where he deconstructs each of the songs with Chris Heuertz on board as enneagram advisor.